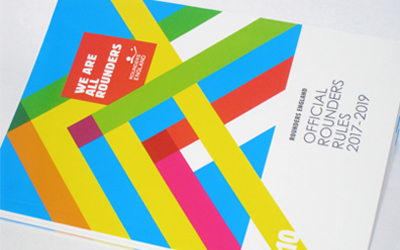 The Official Rounders Rules were first standardised and presented in a formal book in the 1930’s. Up to that point, the rules of Rounders were passed down the generations or through the education system. With the lack of structure, many areas or schools developed their own set of local rules which were integrated into the game. Variations of those rules still exist today, dependent on where you are in the country you may even continue play to some of them. With the growth and development of Rounders outside the education system many of the rules of Rounders had to change, and continue to do so, taking in to consideration the health and safety of the players, participants and spectators. If you were playing Rounders 40 years ago you might remember that a fielder could put a batter out if they touched them with the ball. This led to a few scary incidents, like the time a 6’2” man chased down a 5’ woman in a mixed Rounders match, lunged to get her out and fell on her. No harm done as he formed a ball shape with the woman inside and together they rolled to a halt, where they both emerged unscathed. This was not the case for the majority of incidents where often a nasty bruise was the result. Backstops used to wear face masks so that they could get really close to the batter in order to ‘tig’ them out, intimidating the batter and catching the ball quicker. Hence lots of injured backstops – the face mask only stopped them getting hit in the face, not anywhere else – and many uncomfortable batters. This resulted in a line one metre behind the batting square, where the backstop must remain until the ball has reached or has passed the batter, or risk a penalty for obstruction. Have you ever wondered why the Rounders posts have a funny rubber cap on top? This was the outcome to a piercing injury which a schoolboy endured when he jumped to take the ball on first post and impaled himself on top of it! The 7½ metre distance between the bowler and the batter also emerged to protect the bowler from wayward Rounders balls! Getting hit by a ball is also the reason why batters can’t step out of the front of the square during hitting, or in the course of attempting to hit a ball or until the ball has passed. Weaker bowlers were always in danger of a strong batter charging towards them until this rule was introduced. Likewise, batters cannot step out of the back of the square during hitting and this is to protect the backstop. 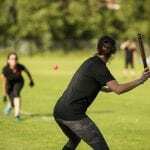 A more recent addition to the Official Rounders Rules is that you have to remember not to drop or throw your bat deliberately. Historically, the equipment in Rounders kits was pretty limited and many people will be able to recall playing with one bat per team. Many injuries happened either from the bat being thrown, or people stepping on it. The grip on approved Rounders bats from Aresson is there to minimise the risk of a bat flying out of a sweaty palm, or when it is raining. This rule, combined with the line for waiting batters has reduced the injuries and risk of death from airborne bats. So, rules are often in place for a good reason, especially when playing sport. The Official Rounders Rules are reviewed every 3 years. You can find out about the process here. For anyone who wants to study the Official Rounders Rules, a copy of the latest edition can be purchased in the Rounders England shop.